Kutztown, PA – When Championship Energy Action Track USA waves its first green flag of the season on May 13, some new faces will join familiar aces in the USAC All Pro SpeedSTR division. With stalwarts like reigning, defending SpeedSTR point champ Tim Buckwalter and two-time track champion Billy Pauch Jr. returning to the progressively banked oval on the Kutztown Fairgrounds, some newcomers with solid backgrounds in the sport will join the ranks in an effort to dethrone the kingpins of the class. Pat Bealer, long known as “the Icon” in the 270cc and 600cc Micro Sprint classes and winner of arguably the most popular, most competitive race ever run at Action Track USA, will make his initial foray into the world of SpeedSTRs this season. Bealer came out on top in the wingless 600cc National during the 2015 Kutztown Fair, the first 60-lap A-Main for the 600’s that became an instant classic. Still heavily involved in Micro Sprint racing – he’s already been a 270 winner this year at Path Valley – Bealer is ready to tackle the larger, somewhat heavier, and more powerful SpeedSTR machines. He’s got a bright yellow No. 4 ready to go when the Goldie & Elton Meitzler Memorial kicks off the 2018 season on Mother’s Day, Sunday May 13, at Championship Energy Action Track USA. Tommy Kunsman will buckle into Mike Stern’s potent SpeedSTR, the car that James Morris piloted with some success over the past few seasons. Kunsman is coming off a terrific year at Linda’s Speedway where he earned three point championships, and the Bethlehem driver recently scored his very first USAC/ARDC Midget victory on the quarter-mile at Linda’s. Kunsman has tasted success at Action Track USA in the wingless 600’s, but 2017 was a year of struggle for him at the Berks County clay playground. He’s looking to rebound in ’18 and a quick win or top five in Stern’s SpeedSTR would provide a big boost to Kunsman and the team. “The Mount Joy Outlaw”, Jesse Maurer, is also busy finishing up the finer details in readying his new ride, the former Kenny Brightbill SpeedSTR, for the May 13 opener in Kutztown. “The whole deal came together quickly and very recently,” said Maurer. “It just worked (financially) for me and I’m really looking forward this new challenge.” Maurer has been solidly consistent in his 600 over the past couple of seasons, winning one time in ’16 and recording numerous top five and top ten finishes. His knowledge of the track and proven ability to drive anything with large tires and a number on it should make him a contender in the SpeedSTR division right out of the gate. In addition, Montgomery, NY’s Anthony Perrego is planning a SpeedSTR assault this season. Perrego started out in the All Star Slingshot class before rapidly moving up to Sportsman, then small and big block Modifieds. He registered his first two Modified triumphs of the year on the weekend of April 21 & 22, and he’s ready to strap back into a SpeedSTR when the new campaign begins on May 13. Perrego has competed in the class before; he was an occasional competitor at Action Track USA a few years ago and was always fast and near the front in his sporadic visits to Kutztown. Wayne Subaru, the sponsor when Billy Pauch Jr. captured his two SpeedSTR point crowns at Action Track USA, returns to back Perrego’s effort in 2018. The USAC All Pro SpeedSTRs, Hyper Racing 600’s, and All Star Slingshots will fill out the menu when the Goldie & Elton Meitzler Memorial raises the curtain on season six of the Rich Tobias/ Doug Rose regime at Championship Energy Action Track USA on Sunday, May 13. Pit gates open at 3 p.m., and the grandstand gates swing open at 4:00. Warm-ups begin at 5 p.m. with qualifying events getting underway immediately following the hot lap sessions. The Meitzler Memorial will be capped off with a 30-lap main for the SpeedSTRs, a 25-lap romp for the 600’s, and a 20-lapper for the All Star Slingshots. Last year’s Meitzler Memorial winners included Tim Buckwalter (SpeedSTRs); Jim Radney (600’s); and Marc Daniels (Slingshots). 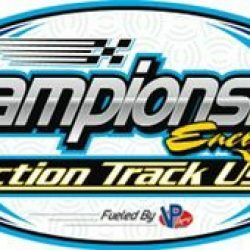 More information on the opener, along with all the news from a busy off-season, is available at www.actiontrackusa.com and on the speedway’s Facebook page.